As we approach Father’s Day 2014, it’s clear that today’s dads are going through a major shift. My lovely wife and I are expecting our first little one and I, for one, am not nervous to change nappies, baby sit and do all the things modern dads are now doing. I’m happy to say that I have the most amazing Dad, Angus. 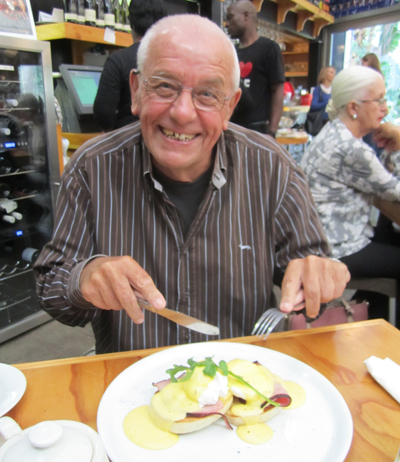 From never moaning once for driving us to the beach during the holidays to visiting me at boarding school and, later on, giving me the very best advice on life and in business. If I can be half the Dad to my little girl that he has been to me, then I will be a very happy father. I remember him returning from a trip to Sydney and telling me of the magnificent Eggs Benedict he had eaten for the first time at their hotel. Whatever your Dad’s favourite meal is, spoil him rotten this Father’s Day! For the sauce: heat the butter until it spits a little and leaves a milky residue in the bottom of the bowl. In a food processor, blend the yolks at high speed. Season well. Slowly drizzle the hot butter into the processor with the motor running, leaving the milky residue behind. Do this slowly or it might split. Pour in the lemon juice, turn off the processor, season again, then stir in the cream. To serve: It’s really easy. Lay the toasted muffins on a hot plate, top with the ham, a poached egg on each half and a good ladle of Hollandaise. Top with chives, freshly ground pepper and a pinch of cayenne. Serve immediately with a cup of hot coffee … and a kiss. And for the perfect gift? For an extra-special finish to a special Father’s Day, get Dad a bottle of wine to enjoy with his favourite steak or roast chicken. 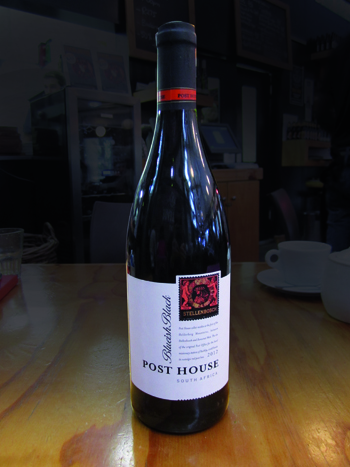 Post House Blueish Black is a blend of Shiraz, Pinotage, Cabernet and Merlot with a nose of mulberries, red currant and ripe strawberries with a hint of pepper and spice. A full bodied rich wine with supple soft tannins for easy drinking. Enjoy now or keep for up to four years.